I’m not about to go about some crazy rampage to tear to the ground whoever thought that it was fair to torture that goldfish. I assume that simple-minded thing didn’t even get paid for his life-risking performance. But then again, three seconds later he would have forgotten that anything of the sort ever happened to him. But I am going to ask another question. Why do we feel out of the water? Because, to tell you the truth, ever since we’ve been squeezed out of our mother’s womb, we’ve been out of the water. Maybe we should get used to it. Maybe we should rethink what water means to us. Maybe we should redefine water. What is your water? Some place where you can shine, perhaps? A close-knit haven where you are sheltered by those who love you and whom you love, even? For most of us, our water is what rinses away the grime and dirt from a day’s work. Our water is what we gulp down without a second thought but helps us through the scorching noontime. Our water is where we sit by, to listen to its melodious giggles and gurgles and forget about slander and accusations. It is what forms us, and it is in our form. To make the chai tea jelly, bring the water to a full boil in a clean pot then turn off the heat. Throw in the tea bags, cover, and let it steep for 5 minutes. Remove the tea bags, and whisk in the brown sugar and agar agar until fully dissolved. Strain the tea into a square glass baking dish (9×9 inches). Let it sit until cool to the touch, then cover with plastic wrap and chill overnight, to set. To serve, shake up the ice, coconut milk, and your preferred sweetener in your cocktail shaker. (Yes this should remind you significantly of a very popular Taiwanese beverage!) Pour it into a glass, to just over half full. 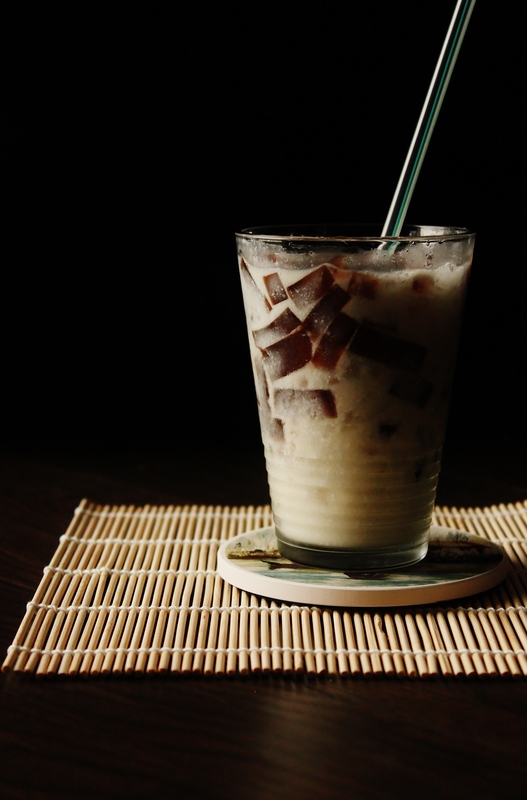 Take a sharp knife and cut the chai tea jelly into rectangular strips, or cubes, it’s really up to you. Add this to the glass of shaken coconut milk. Poke in a straw, swirl it around, and you have it! Enjoy it very well chilled, freshly shaken!